Christopher and Simon Huntington were founders of Norwich. In 1640, Christopher, Simon and their family left England and traveled to the new world to escape religious persecution. 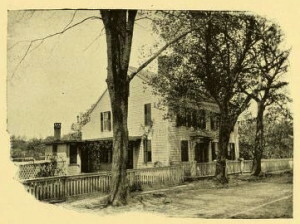 They first settled in Saybrook, then relocated to Norwich. Christopher married Ruth Rockwell in 1652 and their son, Christopher Huntington Jr. was the first male born in Norwich. Upon Christopher Senior’s death in 1691, his son inherited his father’s estate. Christopher Jr. held the town offices of clerk, recorder and was deacon of the church from 1696-1735. *Please turm left onto East Town Street. Watch your footing! *This is a c. 1760 “Norwich Plan” house with an historical date of 1720, apparently the house began as a smaller structure and was added onto circa 1760.